As we explained previously, the question of whether or not the large-scale Turkish assault on the Syrian Kurds moves forward or not depends in large part on Russia. On Thursday Turkey signaled that it had Russia cooperation in its planned invasion, though this was not confirmed by Moscow. As Reuters reported, "Foreign Minister Mevlut Cavusoglu also told broadcaster CNN Turk that Turkey will coordinate with Russia and Iran on an air operation in Afrin." The Turkish build-up of forces could constitute the largest external intervening force thus far in the entirety of the Syrian war, including special forces troops, Army units, Turkish-backed Syrian rebels and Turkey's air force. However, according to many observers, the key element to a successful Turkish operation will be airpower as previously Turkish-backed forces making up "Euphrates Shield Operation" have had little success in the past dislodging Kurdish fighters without air support. On Thursday Syria said it will shoot down any Turkish jets carrying out attacks inside Syria. 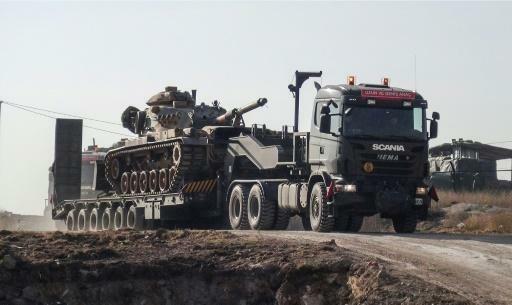 But with all Russian military elements currently departing Afrin it appears that Turkey may have a green light. Indeed according to Bloomberg Turkey’s top general, Hulusi Akar, and intelligence agency chief Hakan Fidan flew to Moscow on Thursday seeking Moscow's approval for the use of Syria's airspace. The United States has urged Turkey to exercise restraint, with State Department spokeswoman Heather Nauert on Thursday responding when asked about the Turkish invasion threat in the following: “We certainly don’t know that that would be the case. We would call on - certainly on the Turks to not take any actions of that sort." Meanwhile, Al Masdar News reports the following major development: "The Syrian government rejected the Kurdish PYD's [Kurdish "Democratic Union Party"] proposal to restore state institutions in Afrin. Damascus demands their security forces be allowed in Afrin." So it appears the Syrian government is now intensifying the pressure for direct access to Afrin, even as Russian personnel pull out and a Turkish invasion threat looms. 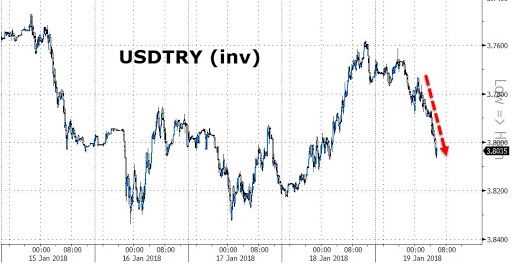 In response to the news of imminent military escalation, the Turkish lira has sold off by 1%, with the USDTRY jumping back over 3.80 as nervous traders try to anticipate what the US response will be to a Turkish action that directly strikes at what the US considers its own geopolitical assets in the region.